If you’ve ever traveled to Mexico, you’re familiar with the FMM — the Forma Migratoria Múltiple that, for most of us, is acquired on a plane. You fill in the blanks while you’re still in the air and surrender half of the FMM when you pass through Mexican customs. Don’t lose the other half! 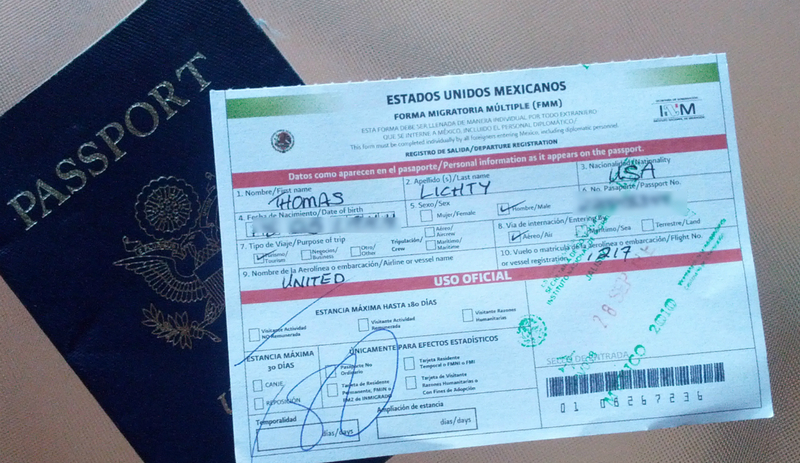 Trying to return without your half of the FMM guarantees an eternal encounter with Mexican bureaucracy. You say you’ve never met anyone who has had that experience? I rest my case. Most FMMs are viable for 180 days. Stay longer than that and … well … re-read the eternal part of paragraph above. We arrived in Mexico September 28th. Our rent is paid through March 31. There are a lot of 31-day months between September and March. Our stay will measure 184 days — four days over the limit. That’s the bad news. The good news is that if you leave Mexico (thereby surrendering your half of the FMM) and return (acquiring a new FMM in the process), you’re good for another 180 days. There are people who tell of crossing the border in Tijuana, having a cup of coffee in San Diego, then returning to Mexico for another six months. In other words, we gotta get outta Dodge. The solution? Home for the holidays! As much as we love Puerto Vallarta, there’s nothing like being with friends and family at Christmastime. There will be Christmas trees (no falling coconuts! ), people in puffy parkas (bikinis don’t cut it on Christmas Day), caroling (in case Little Drummer Boy mariachi-style fails to amuse), and — a nod to Louise — Nordstrom’s Rack. So off we will go, departing December 19th. All the reservations are made. Friends and family have been notified. We’re hoping for a day in the snow at Timberline Lodge. Turkey dinner with grandkids. We will even stay in the hotel where we were married! And, of course, we will acquire new FMMs, good for another 180 days. There are few things more gratifying than foiling bureaucracy. If this is a job, I’m not giving it up! Back for Christmas !! Long live to the FMM ! Everybody will be so happy to see you !! And we will be happy to see you again, dear Mapi. There will be many happy hours! Mexican bureaucracy! In 1973 I tried to fly back home after spending 5 months in Mexico with my boyfriend. I never noticed that my visa was good only for a few weeks! They wouldn’t let me out of the country. My boyfriend had to spend hours talking to officials in Mexico City, getting his bosses to vouch for us – a whole week we were supposed to be in Guadalajara – and finally they let us go. ON previous visits, the visa had been granted for 6 months so we never even looked at it. Scary. And where did you stay, Janet, during that week? A Mexican jail, perhaps? Did you carve your initials on the wall? Our visit to Portland will have been a failure if time with the Caseys is not part of it. It’s a priority! Thanks, Terri. Of all people, you should know! We’re beginning to appreciate our home visit already.